The Clark County democratic convention was held Saturday. It was a do-over from February. Hillary won and she now leads Obama statewide in delegates to the state convention. More than 6,300 delegates participated Saturday, according to the Nevada Democratic Party. Clinton won 1,330 delegates from Clark County while Obama won 1,133 delegates. Heading into Saturday, Obama had won the majority of the delegates in the state’s other 15 county conventions, 512 of 900. 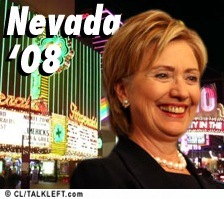 But Clinton’s win in Clark County, by far the state’s most populous county, gave her the lead statewide 1,718 to 1,645, for delegates to the May 17 state convention in Reno, where Nevada Democrats will select delegates to the national convention in Denver this August.